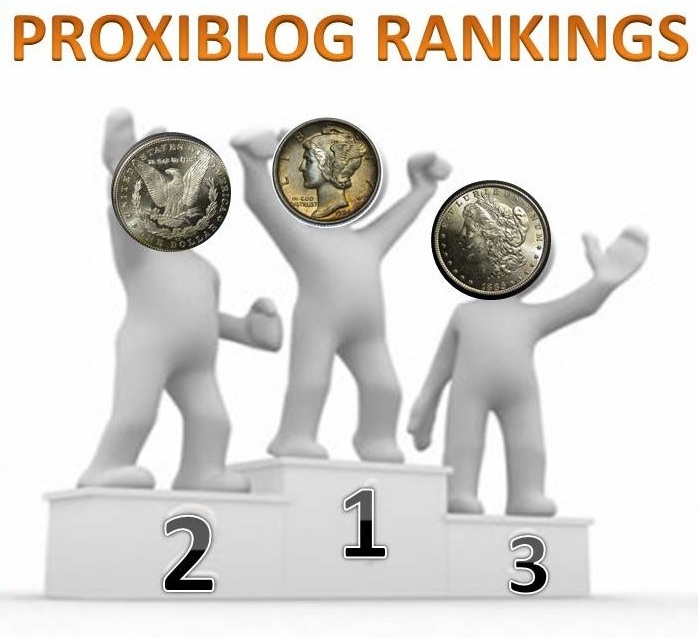 Proxiblog’s Coin and Currency category has three additions to its monthly rankings, welcoming back Mike Peterson Auctioneers, Ritmar Exchange and Braden Auction Services, all continuously working on improvements. The rest of our list remains relatively stable with the top 15 or so houses featuring good consignments, quality photos and excellent customer service. Some of our favorite houses are falling in the rankings because the infrequency of their events, a factor in our tallies. 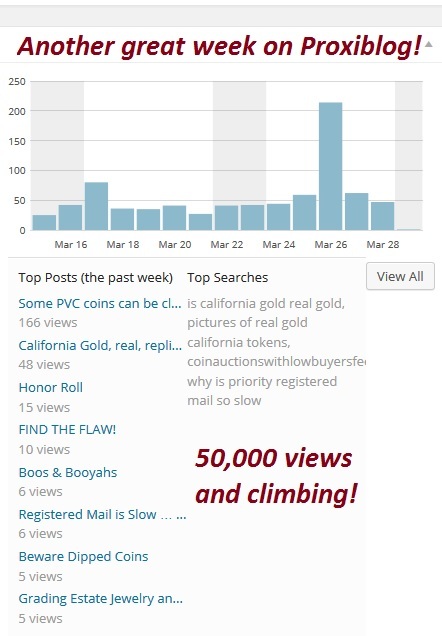 Weaver Signature Coin and Currency Auction shares the top spot with Capitol Coin Auction, scoring a full 25 points. Dave Weaver continues to describe coins’ conditions accurately, noting flaws. Also moving up is Fox Valley Coins, which just hosted one of the highest bid auctions of the year, with more than 1200 lots of mostly superior coins. Leonard Auction, a long-time favorite, holds its slot. Back to the Past Collectibles continues to work hard on photo enhancements, and so is enjoying greater bids and more return customers. As stated earlier, we are happy to welcome back to our rankings Ritmar Exchange, Mike Peterson Auctioneers and Braden Auction Service. These houses continue to work on behalf of consignor AND seller. As you can see by our numbers, ranging from 23.5-25 point, very little separates one auction house from another. Many of those lower on the scale are not working sufficiently on photography or offering mediocre consignments. A few dropping even further are not scheduling events. After four months, those houses will drop off our lists. Keep in mind that these houses rank among our most favorite. Your experience may differ from ours. We’re increasingly global with top views from the USA, Britain, Canada, India, Russia, Germany, Australia and the Philippines. Continuing as our most popular post is California Gold, real, replica and fake. Below is a graphic that you can click to expand, seeing where our viewers are most likely to navigate. We continue to provide best practices and numismatic knowledge to our viewers for free. Please consider making a donation. We post every weekday and do this for educational purposes, informing viewers about numismatics as well as funding scholarships for Iowa State University students. Fortunately, we have several of our top houses donating funds to our scholarship account. You can also buy our Basic Coin Design book on Kindle. We are extremely grateful. Won’t you consider making a tax-deductible donation to the Iowa State Foundation so that we can continue publishing? Thank you for your consideration! This entry was posted in Uncategorized and tagged Back to the Past Collectibles, Braden Auction Services, Capitol Coin Auction, Fox Valley Auction, Mike Peterson Auctioneers, RitMar Exchange, Weaver Signature Coin and Currency Auction. Bookmark the permalink.